The 1987 Mustang GT design benefited from the new flush mounted headlamps, front fascia, a return of bodyside skirts, and smooth rear quarter windows which extend over the previous year's fixed louvers. 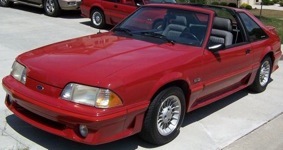 Only two engines were available for the 1987 Mustang: a 90hp 2.3L inline-4-cylinder for the standard Mustang LX, and a 225hp 5.0L V8 for the Mustang GT. Popular 1987 options include t-tops and the new turbine wheels. The Mustang GT finally received it’s own model number in 1987. The GT model can now be easily identified in the Vehicle Identification Number by a P42 for the hatchback or a P45 for the convertible. Oxford White 1987 Mustang GT convertible with smoked taillights, Cervinis Cobra rear bumper, Saleen style wing, and white Cobra R wheels. Red 1987 Mustang GT hatchback owned by Joe Cerino from Auburn, New York. This car has a lot of modifications inside and out. Custom Medium Charcoal Metallic over Silver 1987 Mustang GT convertible with a rebuilt 5.0 liter V8 engine, 1991-93 Mustang wheels, and an aftermarket spoiler. Scarlet Red 1987 Mustang GT hatchback with 225hp (at 4000rpm), 302 cubic inch (5.0 liter), electronic fuel injected, high-output V8 engine. Looks like his and hers cars, see the identical one in the background. Silver 1987 Mustang GT hatchback owned by Rob Falcone. This Mustang has the 302ci 5.0L V8 and a manual transmission. Rob tells us more, "I went for a ride in this car eight years ago and really enjoyed the ride. Every summer I would always ask the previous owner, 'When are you going to bring out the Mustang again?' Never saw the car again. Last year he came up to me and told me he was selling the car. I couldn't get to the bank fast enough. He had the car just under eight years and put less than 400 miles on it. Last summer I put 1600 miles on the car. Truly awesome and enjoying it." Black 1987 Mustang GT convertible owned by Jan and Ken Benson from Sydney, NSW, Australia. This is our featured, Attitude Of The Week for the week starting March 25, 2012. Ken tells us, "We have had the Mustang for over 13 years and purchased from Ross Donley who races Mustangs in Australia. We had a 1979 coupe over 30 years ago and decided to buy a later model. The motor was upgraded to a 93 Cobra R, Gold track racing diff, computer system, special made wheels, Celini bonnet, after market taillights, rear wing, 5-speed manual Hurst shifter etc. My son and I bought a 1970 convertible. We have been members for 13 years of MOCA Mustang Owners Club NSW Australia. I write articles in our club magazine 'Pony Express'. We have around 700 members in our club in NSW." Customize Sunburst Orange Mustang GT with Cervinis Ram Air hood, Stalker front bumper, Cobra rear, Saleen side skirts, S-281 Wing with fiberglass deck lid, 18 inch Ford Motorsport chrome Cobra wheels, integrated antenna, one piece headlights, and shaved door handles. Not quite an official Saleen (because the work was not done at Saleen, and its not all Saleen parts), but very close. Oxford White 1987 Mustang GT fastback owned by Kevin James from Veneta, Oregon. It has a 5.0L V8 engine and a manual transmission. It has: tubular A-arms(front); Eibach pro-lowered springs, strut's, shocks; Eibach sway bars front and rear; fr500 18x9 front wheels/265/35 18-inch and rear-285/35 18-inch Nitto 555 extreme zr tires; sn/95 front brakes and 5-lug rear conversion; new hHertz stereo with sub; cold air intake; BBK headers and short throw shifter; lx tail lights; and new front headlights and markers. Oxford White 1987 Mustang GT convertible with a 225hp (at 4200rpm), 5.0 liter (302ci), electronic fuel injected, high-output, V8 engine. Dark Gray 1987 Mustang GT hatchback with sport wheels; titanium lower two-tone; blue accent side body trim; and the 225hp (at 4200rpm), 302ci (5.0L), High Output, V8 engine.